That said, I have a long rant on my take of what is going on and what America needs to do. Briefly, we’re chest deep in the tibia river. Going forward is certain death as the river is too deep to stay on the current course. Staying or not backing out of the river will not get us where we want to be. It’s time to leave. The War in Iraq has failed by any standard. There were no WMDs, it didn’t bring democracy or freedom and we took a murderous bully that gave the region stability and replaced him with us (another equally murderous bully to the civilians there!) and no stability. The U.S. brought Iraq a civil war but it won’t (can’t) bring Iraq a peaceful end. American diplomatic means won't be successful because we waited too long, harmed too many, failed others and marginalize what could have been allies. Armed militias (many armed by the U.S) are in most of Iraq’s cities and towns. The militias are small, loosely associated tribal gangs with no real central control. Much of the current chaotic violence has to do with revenge and turf rivalry. America can’t bring any degree of stability or end to the violence mainly because it’s widespread but not centralized. 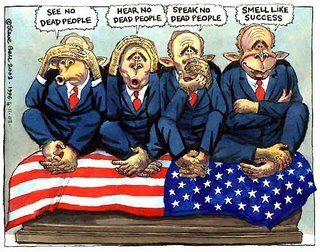 There is no one group to negotiate with…no one issue…no one bargaining chip... no one potential ally to break the now hourly cycle of violence that the U.S. Iraq war put in place. Plainly speaking this is our mess but there is no solution other than withdrawal. The larger militias are splintered in power and leadership (by design or rival power plays?). 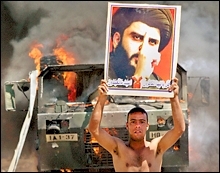 Still the most powerful and influential is the Iraqi Shiite militia (called Mahdi Army). 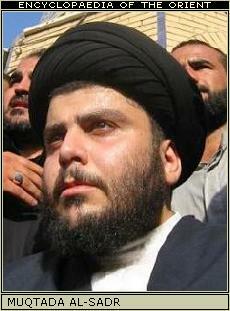 It's leader is Moktada al-Sadr. Whenever you hear about uniformed Iraq soldiers infiltrating or kidnapping or killing, they are most likely members of Moktada Al-Sadr’s group. Every young man (age 13-35) either directly or passively supports the Mahdi Army and it's leader al-Sadr. It is a very powerful group among the profusion of groups in Iraq that carry out executions and paramilitary operations. “In a reflection of the growing new dimension of civil strife" a senior U.S. intelligence official said yesterday that the militia of radical Shiite leader Moqtada al-Sadr has grown eightfold over the past year and now fields 40,000 to 60,000 men. That makes it more effective than the Iraqi government’s army! The official also said “Sadr is so powerful that if provincial elections were held now, he would sweep most of the south and also take Baghdad.” The Mahdi Army and leadership is one of the main forces in Iraq. Currently the U.S. (under Bush) would like to disarm the Mahdi especially in Baghdad. This Shiite militia has a close association with Iran and to broker peace the Mahdi must be dealt with…but at what cost? Surely we will see genocide of the Baath and Al Qaeda supporters in Baghdad (we already are). Add in the Badr and Fadhila militias, various tribal leaders, Iraqi private security contractors, quasi religious and government militias, criminal gangs and local town militias and you have a cauldron already boiling over and threatening to explode throughout the region. Disarming the Mahdi Army won't be possible. It will just ignite the explosion. The U.S. military is no longer able to defeat a bloody insurgency in western Iraq or counter al-Qaeda's rising popularity. As it stands today, Iraq will likely become several states instead of one larger country. Each area will be determined by local militias that identify by both ancestry and religious grouping. And each area will have 'ethnic cleansing' carried out by rival groups. There's more death and destruction to come but make no mistake, it was set in motion by the United States. I’ve hear talk of replacing Prime Minister Nuri Kamal al-Maliki, including comments from the Bush administration that they are disappointed in his inability to control the violence. But al-Maliki wouldn’t abide one day in Parliament without Mr. Sadr’s support, just as anyone we might replace him with.The U.S. talks about putting in a ‘strongman’ that would be independent of the Mahdi…but that’s a long dead pipedream... It was left too late. Power bases have been established and external forces shored up. America must now accepted that the devil they got rid of (Saddam) was much tamer and controllable and stabilizing to the Middle East than the outcome of Bu$h's ill advised war. Iraq is not on the "edge of civil war". It is in the midst of it. It's a steep price to inflict on Iraq and the middle east for the pleasure of seeing Saddam Hussein die. As to stability in the Middle East….Jordon has so many refugees that have fled Iraq (est. at 1 million) that it’s borders have crease to function and it will probably crease as a country in the near future. Look for a land grab in the next five years by neighboring states. Syria and Iran have both taken in hundreds of thousands and have taken an active role (at least behind the scenes) to move Iraq toward a stronger state in lending them stability and more power through Shiite rule. Egypt and Saudi Arabia would like to see the U.S. continue to try but obviously fail to re-establish a more pluralistic and passively controllable government. Neither is willing to risk their armies and name to such an outcome. The most America can look for is money and arms with some behind the scenes string pulling. Recent reports have the Mahdi army sending 300 fighters to Lebanon, ostensibly to fight alongside Hezbollah. There seems to have been a strategic decision taken sometime over late winter or early spring by Damascus, Tehran, along with their partners in Lebanese Hezbollah, to provide more support to Sadr to increase pressure on the U.S. I don’t really believe this was a mutually agreed upon joint decision but one that played out to the benefit of Lebanon and Iran and especially for al-Sadr. The Mahdi army can now clearly call the ‘shots’ in determining Iraq’s future. They certainly have more influence and power than the U.S. et al combined. The United States needs to fold their tents and slink back into America. There can be no clear victory or win. Military force or a gradual draw down of troops will not prevail or change conditions on the ground. The outcome will be the same regardless. It is civil war (yes we created it!) but there is no strategic move that will bring both stability and peace that would be acceptable by the current power players or the general population. The best we can do is withdrawal and lend humanitarian assistances for the coming days while the state of Iraq determines its own destiny. It’s not about the man- presidents come and go, governments come and go. It’s the frustration of feeling like the whole country and every single Iraqi inside and outside of Iraq is at the mercy of American politics. It is the rage of feeling like a mere chess piece to be moved back and forth at will. It is the aggravation of having a government so blind and uncaring about their peoples needs that they don’t even feel like it’s necessary to go through the motions or put up an act. And it's the deaths. The thousands of dead and dying, with Bush sitting there smirking and lying about progress and winning in a country where every single Iraqi outside of the Green Zone is losing. I wish I had a magic wand to wave over Iraq and fix what the United States put into motion. But the reality is "it is what it is", the United States must take responsibility, face up to what has come to pass, and withdrawal immediately. Iraq must determine it's own destiny. American can only look on, give humanitarian assistances, and any additional aid if determined by the international community. Yes we created this mess, but now the United States will do the right thing, the only thing, that can possibly help, we'll withdrawal from the region while offering help and assistance to Iraq in determining it's own future. Yes, Iraq is a catastrophe of Biblical proportions. Let's take a few moments and look at some of the details of the event without which the Bush regime never would have been able to scare most Americans into thinking it was necessary to invade Iraq, the event around which America's foreign policy has been inextricably wrapped ever since. One thing that struck me as odd in the days after 9/11 was Bush saying "We will not tolerate conspiracy theories [regarding 9/11]". Sure enough there have been some wacky conspiracy theories surrounding the events of that day. The most far-fetched and patently ridiculous one that I've ever heard goes like this: Nineteen hijackers who claimed to be devout Muslims but yet were so un-Muslim as to be getting drunk all the time, doing cocaine and frequenting strip clubs decided to hijack four airliners and fly them into buildings in the northeastern U.S., the area of the country that is the most thick with fighter bases. After leaving a Koran on a barstool at a strip bar after getting shitfaced drunk on the night before, then writing a suicide note/inspirational letter that sounded like it was written by someone with next to no knowledge of Islam, they went to bed and got up the next morning hung over and carried out their devious plan. Nevermind the fact that of the four "pilots" among them there was not a one that could handle a Cessna or a Piper Cub let alone fly a jumbo jet, and the one assigned the most difficult task of all, Hani Hanjour, was so laughably incompetent that he was the worst fake "pilot" of the bunch, with someone who was there when he was attempting to fly a small airplane saying that Hanjour was so clumsy that he was unsure if he had driven a car before. Nevermind the fact that they received very rudimentary flight training at Pensacola Naval Air Station, making them more likely to have been C.I.A. assets than Islamic fundamentalist terrorists. So on to the airports after Mohammed Atta supposedly leaves two rental cars at two impossibly far-removed locations. So they hijack all four airliners and at this time passengers on United 93 start making a bunch of cell phone calls from 35,000 feet in the air to tell people what was going on. Nevermind the fact that cell phones wouldn't work very well above 4,000 feet, and wouldn't work at ALL above 8,000 feet. But the conspiracy theorists won't let that fact get in the way of a good fantasy. That is one of the little things you "aren't supposed to think about". Nevermind that one of the callers called his mom and said his first and last name ("Hi mom, this is Mark Bingham"), more like he was reading from a list than calling his own mom. Anyway, when these airliners each deviated from their flight plan and didn't respond to ground control, NORAD would any other time have followed standard operating procedure (and did NOT have to be told by F.A.A. that there were hijackings because they were watching the same events unfold on their own radar) which means fighter jets would be scrambled from the nearest base where they were available on standby within a few minutes, just like every other time when airliners stray off course. But of course on 9/11 this didn't happen, not even close. Somehow these "hijackers" must have used magical powers to cause NORAD to stand down, as ridiculous as this sounds because total inaction from the most high-tech and professional Air Force in the world would be necessary to carry out their tasks. So on the most important day in its history the Air Force was totally worthless. Then they had to make one of the airliners look like a smaller plane, because unknown to them the Naudet brothers had a videocamera to capture the only known footage of the North Tower crash, and this footage shows something that is not at all like a jumbo jet, but didn't have to bother with the South Tower jet disguising itself because that was the one we were "supposed to see". Anyway, as for the Pentagon they had to have Hani Hanjour fly his airliner like it was a fighter plane, making a high G-force corkscrew turn that no real airliner can do, in making its descent to strike the Pentagon. But these "hijackers" wanted to make sure Rumsfeld survived so they went out of their way to hit the farthest point in the building from where Rumsfeld and the top brass are located. And this worked out rather well for the military personnel in the Pentagon, since the side that was hit was the part that was under renovation at the time with few military personnel present compared to construction workers. Still more fortuitous for the Pentagon, the side that was hit had just before 9/11 been structurally reinforced to prevent a large fire there from spreading elsewhere in the building. Awful nice of them to pick that part to hit, huh? Then the airliner vaporized itself into nothing but tiny unidentifiable pieces most no bigger than a fist, unlike the crash of a real airliner when you will be able to see at least some identifiable parts, like crumpled wings, broken tail section etc. Why, Hani Hanjour the terrible pilot flew that airliner so good that even though he hit the Pentagon on the ground floor the engines didn't even drag the ground!! Imagine that!! Though the airliner vaporized itself on impact it only made a tiny 16 foot hole in the building. Amazing. Meanwhile, though the planes hitting the Twin Towers caused fires small enough for the firefighters to be heard on their radios saying "We just need 2 hoses and we can knock this fire down" attesting to the small size of it, somehow they must have used magical powers from beyond the grave to make this morph into a raging inferno capable of making the steel on all forty-seven main support columns (not to mention the over 100 smaller support columns) soften and buckle, then all fail at once. Hmmm. Then still more magic was used to make the building totally defy physics as well as common sense in having the uppermost floors pass through the remainder of the building as quickly, meaning as effortlessly, as falling through air, a feat that without magic could only be done with explosives. Then exactly 30 minutes later the North Tower collapses in precisely the same freefall physics-defying manner. Incredible. Not to mention the fact that both collapsed at a uniform rate too, not slowing down, which also defies physics because as the uppermost floors crash into and through each successive floor beneath them they would shed more and more energy each time, thus slowing itself down. Common sense tells you this is not possible without either the hijackers' magical powers or explosives. To emphasize their telekinetic prowess, later in the day they made a third building, WTC # 7, collapse also at freefall rate though no plane or any major debris hit it. Amazing guys these magical hijackers. But we know it had to be "Muslim hijackers" the conspiracy theorist will tell you because (now don't laugh) one of their passports was "found" a couple days later near Ground Zero, miraculously "surviving" the fire that we were told incinerated planes, passengers and black boxes, and also "survived" the collapse of the building it was in. When common sense tells you if that were true then they should start making buildings and airliners out of heavy paper and plastic so as to be "indestructable" like that magic passport. The hijackers even used their magical powers to bring at least seven of their number back to life, to appear at american embassies outraged at being blamed for 9/11!! BBC reported on that and it is still online. Nevertheless, they also used magical powers to make the american government look like it was covering something up in the aftermath of this, what with the hasty removal of the steel debris and having it driven to ports in trucks with GPS locators on them, to be shipped overseas to China and India to be melted down. When common sense again tells you that this is paradoxical in that if the steel was so unimportant that they didn't bother saving some for analysis but so important as to require GPS locators on the trucks with one driver losing his job because he stopped to get lunch. Hmmmm. Further making themselves look guilty, the Bush administration steadfastly refused for over a year to allow a commission to investigate 9/11 to even be formed, only agreeing to it on the conditions that they get to dictate its scope, meaning it was based on the false pretense of the "official story" being true with no other alternatives allowed to be considered, handpicked all its members making sure the ones picked had vested interests in the truth remaining buried, and with Bush and Cheney only "testifying" together, only for an hour, behind closed doors, with their attorneys present and with their "testimonies" not being recorded by tape or even written down in notes. Yes, this whole story smacks of the utmost idiocy and fantastic far-fetched lying, but it is amazingly enough what some people believe. Even now, five years later, the provably false fairy tale of the "nineteen hijackers" is heard repeated again and again, and is accepted without question by so many Americans. Which is itself a testament to the innate psychological cowardice of the American sheeple, i mean people, and their abject willingness to believe something, ANYTHING, no matter how ridiculous in order to avoid facing a scary uncomfortable truth. Time to wake up America. Where the hell was the Air Force? It's Not A Game...Or Is It? They Lost But Still Cheated! Is The Fat Lady Singing? Want To Be A Hero? Top Ten Reasons To Vote For Coleen Rowley! Bill Clinton for Mike Hatch and Students Voting!